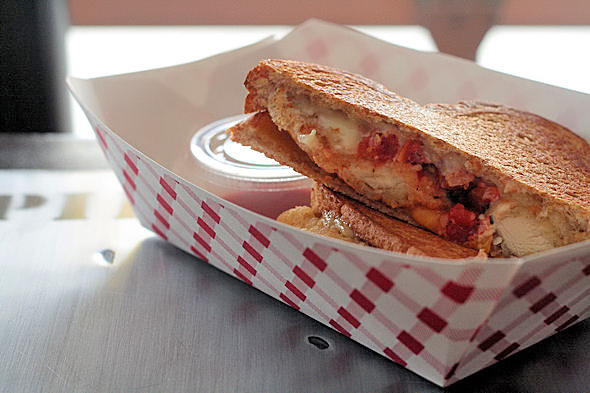 MELT Grilled Cheese is going to make a lot of hungry Humber College students happy. Open for almost two weeks now, MELT has taken up residence down the street from the college's Lakeshore campus, and is already a strong presence in the neighbourhood. 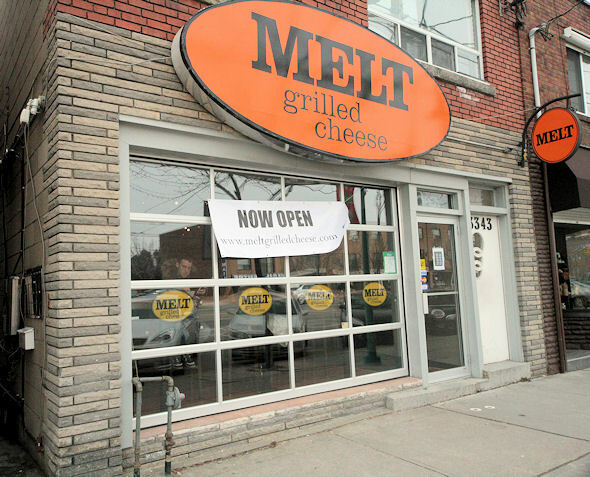 Reportedly forced to close early after selling out on the day of their grand opening, MELT is taking Etobicoke by storm and satisfying local lactose cravings. The space itself is fairly generic, with window-facing barstools and a touch of exposed brick giving it bit more warmth than your average fast food joint. To be fair though, MELT isn't claiming to be anything it isn't. 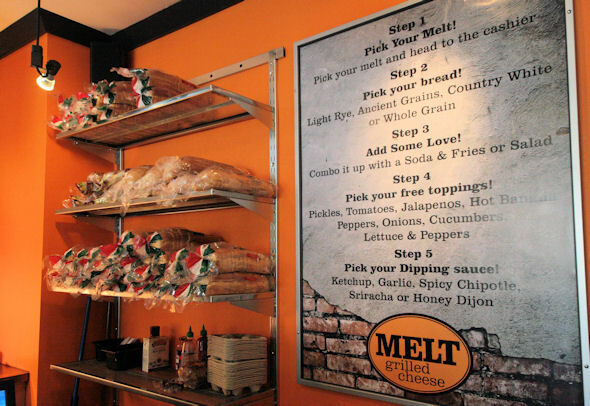 While other grilled cheese places are offering up local and/or organic, elevated fare, MELT is more of a back to basics operation. Customers choose their sandwich, bread, and whatever free toppings they want. It is then placed in one of their timed sandwich presses, that I assume are set to golden-brown, and laid to rest in a wax-paper lined basket. They are the Subway of grilled cheese restaurants. We ordered a trio of sandwiches and waited for our number to be called. 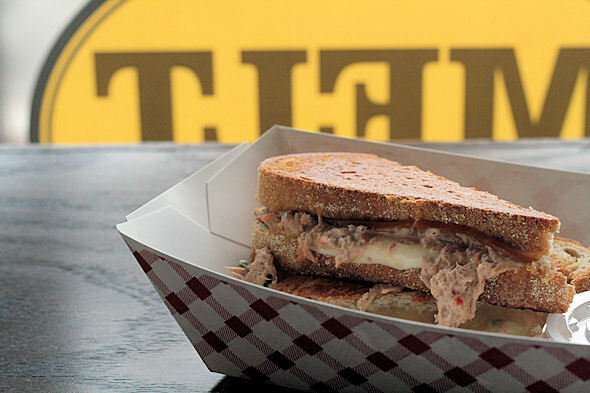 The Toronto Tuna on rye ($5.99) came topped with smoked cheddar, mozzarella, roasted red pepper and sriracha mayo. The generous amount of tuna however left us wanting for more of that smoked cheddar flavour, which was a bit absent, as was the expected kick in the mayo. It wasn't bad for say, a tuna melt, but coming from a grilled cheese place it needed more, well...cheese. My Tattooed Chicken ($6.99) with bacon, cheddar, mozzarella, herbed tomato and MELT sauce on multigrain bread turned out to be the favourite of all three. The chicken wasn't exactly crispy as promised but the herbed tomato and MELT sauce gave it a bruschetta like quality, and the cheese had a much stronger presence on my sandwich than it did on its tuna counterpart. The Classic ($2.99) didn't go over well with our pint-sized dining companion who complained that he didn't like the cheese. 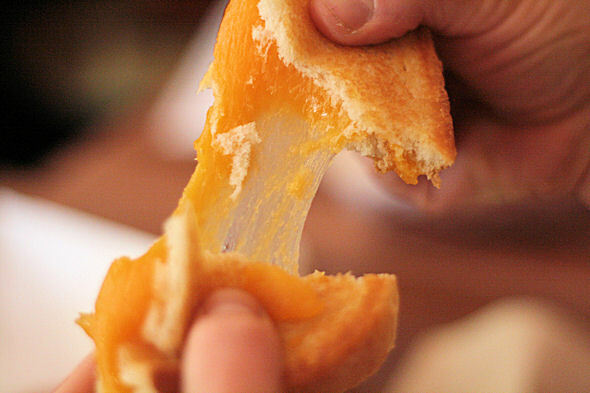 This is only due in part to the fact that he (along with others of his age crowd) has grown accustomed to grilled cheese sandwiches made with the orange square slices that are just about as plasticky as the sleeves they come wrapped in. The poor bugger couldn't appreciate the sharp Canadian cheddar...but I did when I stole a few bites from his cast offs. It was worthy of its name, and priced very fairly. I've seen a lot of places around Mimico and Long Branch open up only to close shortly after, but a new wave of restaurants appear to be here to stay — ones like MELT and FBI Pizza that are putting a bit more effort and money and effort into their establishments and the products they're turning out.